International Director Joyce Middleton and DG Tom Plagman presenting Rodger Palmer with the very prestigious International President's Award for activities with the Global Service initiative. It is the second highest award given by the LCI President. Last year Dr Armand Radke, the eye doctor from the Detroit Lakes Lions, received this award for his work with Eyes for Mexico. These are the highest awards given out and very, very few people have received these highly coveted and prized awards! Congratulations Lion Rodger! New members were pinned Sunday at the Vergas Lions 50th anniversary event. International Director Lion Bruce Beck (from left) announced the new centennial members and their sponsors, sponsor Vergas Lions President Rick Hanson, sponsor Lion Sandy & David Antonsen, new Lions John Lotzer & Janelle Lotzer, new Lion Al Krook, new Lion members Bill & Sandy King. 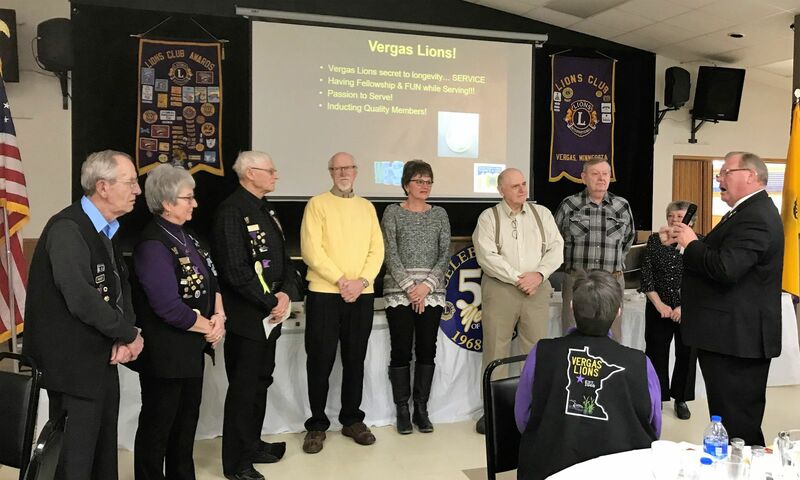 Celebrating 50 years of service to the community and worldwide, the Vergas Lions gathered for a grilled steak supper and presentation Sunday, Feb. 11 at the Vergas Event Center. Vergas Lion Dennis Breitzman called the program to order followed by the National Anthem sang by Miss Vergas Alex Day. She also sang two more songs throughout the evening, closing with a number by Frank Sinatra. Lion Mike Goettel led the group in prayer before the meal was served. Vergas Lions President Rick Hanson welcomed everyone and Dennis introduced the special guests. Lions David and Sandy Antonsen talked about the history of Vergas with a PowerPoint presentation. Sandy spoke about the Vergas Lioness ladies and recalled the fun they had serving others. It was bittersweet when they disbanded June 30, 1999, losing a few members when they merged with the men in the Vergas Lions Club. “I’m proud to be a member of the Lioness / Lions for many years … together we serve!” Sandy added. Following the Antonsens, guest speaker International Director Lion Bruce Beck of Palisade talked about the history of the Lions Clubs International and the Vergas Lions Club. While the steak supper was being served Bruce talked about the many services and events the Lions bless the community and beyond with. Lions are known as "Knights of the Blind" focusing on programs and services for the blind and visually impaired – and aim to eliminate preventable and reversible blindness. Lions are the world's largest service club organization with 46,000 clubs and 1.4+ million members. Members do whatever is needed to help their local communities and worldwide. Lions Clubs are known for helping others with vision with eyeglasses and prevention of blindness, but there is so much more to being a Lion. In Vergas, some of the services include: Blood drives for 35 years, youth Halloween party, Craft Fair, Vergas Event Center cash bar at events, youth scholarships, ditch cleaning, aluminum can recycling, Looney Daze biscuits/gravy breakfast, eyeglass & hearing aid collection, working in the community, Miss Vergas & Princess Altona Pageant & Scholarships, Kamp KACE (Kids Against Cancer Everywhere), Can Do Canines, LCIF (Lions Clubs International Foundation), Leader Dogs, LEHP (Lions Eye Health Program), MD5M Hearing Foundation, MN Diabetes Foundation - Golf Tournament Fundraiser, MN Lions Vision Foundation, Project New Hope, Youth Exchange, and Youth Outreach. More services included building a shelter at Trowbridge Zoo in Vergas, fish fry and tournament, Fall Harvest Ball, Maple Syrup Fest, Journey for Sight Walks, handicap ramps, sponsorship to Boy Scouts, Little League and Babe Ruth programs, and more. New members were pinned at the Vergas Lions 50th anniversary event. The new Lions Club centennial members were Bill King, Sandy King, John Lotzer, Janelle Lotzer, and Al Krook, sponsored by Lions Sandy Antonsen, David Antonsen and Vergas Lions President Rick Hanson. Two Lions were recognized as recipients of the Lions Certificate of Appreciation for going above and beyond their duties, including April Wurst, Frazee, and Dennis Breitzman of Vergas. The Vegas Lions chartered on Feb. 19, 1968 with Fergus Falls as their sponsor club. The charter members were: First President Gordon Dahlgren, 2nd Vice President Vern Stardig, 3rd Vice President Paul Anderson, Secretary Lyle Priske, Treasurer Lee Davis, Tail Twister Lee Frederich, Lion Tamer Ralph Woodall, Directors Rodney Hanson, Bernard Furey, Claudie Bruhn and Leroy Pokornowski; other charter members were Marvin Monson, William Richter, Marlo Sonnenberg, Walter Berend, Lloyd Cromwell, Armin Dey, Karl Fankhanel, Stanley Glawe, Gilman Gunstinson, Roger Hanson, Leonard Hillstrom, Ambrose Hinze, Donald Peterson, E.A. Peterson, Lavern Sonnenberg, Loren Sonnenberg, and Donald Zitzow. Dennis closed the evening by thanking Sandy Antonsen and the ladies for decorating and all their hard work, Chef Brian Bigger for grilling the delicious steaks in frigid temps, the Lions Clubs of Dunvilla, Wolf Lake and Frazee for hosting the event, and the Frazee-Vergas Robotics Club, students, parents and instructor Andy Paulson, for cleaning up. The Vergas Lions love working with and meeting new people in the community they serve. Meetings are held the second Tuesday of the month at 6 p.m. at the Vergas Event Center. Get involved and serve others. To join, or for more information call Sandy Antonsen, 342-3056, e-mail, dndsantonsen@arvig.net or call Rodger Palmer, 841-0302, e-mail, repotter@eot.com.